Plans for pylons on Anglesey and an electricity tunnel across the Menai Strait have been scrapped. National Grid has confirmed it is withdrawing its plans to connect a proposed new nuclear power station in Anglesey to the electricity network. It follows the decision by Horizon to suspend work on Wylfa Newydd. 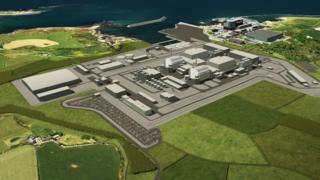 The grid said it would look closely at any other proposals that come forward to revive the plans at Wylfa. National Grid had planned for a new line of pylons and a tunnel at the Menai Strait, and had applied to the Planning Inspectorate for the plans to be reviewed. The statement comes two days after Welsh Secretary Alun Cairns met representatives of Horizon's parent company Hitachi in Tokyo. First Minister Mark Drakeford is due to meet Horizon at Wylfa on Thursday before he chairs a meeting of his cabinet in Llandudno. Why is the government cooling on nuclear? What's Wylfa - and why is it so important?